This envelope from England and addressed to Stockholm was salvaged in a water soaked condition from the British Airways Lockheed Electra G-AESY plane which caught fire on the approach to Copenhagen forcing the pilot, Capt. Wright to ditch in the sea on 15 August 1939 near Vordingborg with the loss of the passengers. The plane was raised from the sea the next day and the mail recovered and forwarded. 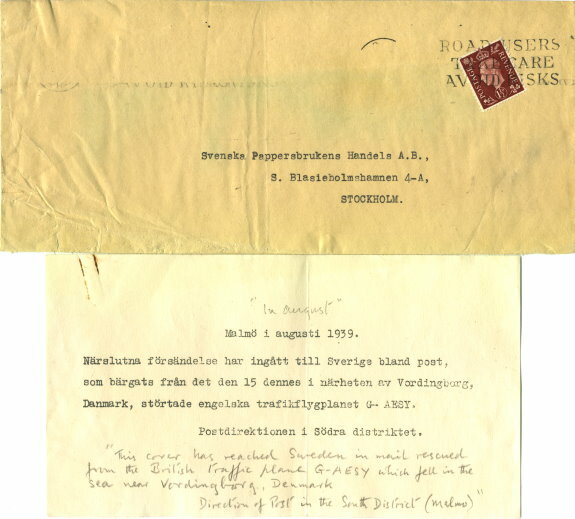 This envelope was taken to Malmö and delivered in a clear envelope with the typewritten note from the Swedish postal authorities.